Three different studies, done by different teams of scientists proved something really extraordinary. But when a new research connected these 3 discoveries, something shocking was realized, something hiding in plain sight.Human emotion literally shapes the world around us. Not just our perception of the world, but reality itself. In the first experiment, human DNA, isolated in a sealed container, was placed near a test subject. Scientists gave the donor emotional stimulus and fascinatingly enough, the emotions affected their DNA in the other room. In the presence of negative emotions the DNA tightened. In the presence of positive emotions the coils of the DNA relaxed. The scientists concluded that “Human emotion produces effects which defy conventional laws of physics.” Here is a study that shows the emotional effect of positive and negative words. In the next study, similar but unrelated experiment, different group of scientists extracted Leukocytes (white blood cells) from donors and placed into chambers so they could measure electrical changes. In this experiment, the donor was placed in one room and subjected to “emotional stimulation” consisting of video clips, which generated different emotions in the donor. The DNA was placed in a different room in the same building. Both the donor and his DNA were monitored and as the donor exhibited emotional peaks or valleys (measured by electrical responses), the DNA exhibited the IDENTICAL RESPONSES AT THE EXACT SAME TIME. Read more: New Research Shocks Scientists: Human Emotion Physically Shapes Reality! Can you guess what area of the picture is showing negative '''self-talk'''? 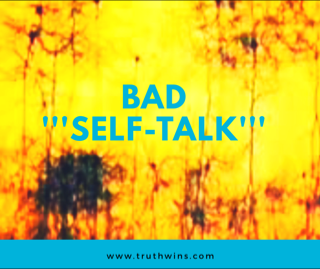 Stress is the direct result of toxic '''self-talk'''. The affects of stress may seem overwhelming, but don't be discouraged because it really is possible to change your '''self-talk'''. In a classic research-based TEDx Talk, Dr. Lara Boyd describes how neuroplasticity gives you the power to shape the brain you want. Our knowledge of the brain is evolving at a breathtaking pace, and Dr. Lara Boyd is positioned at the cutting edge of these discoveries. In 2006, she was recruited by the University of British Columbia to become the Canada Research Chair in Neurobiology and Motor Learning. Since that time she has established the Brain Behaviour Lab, recruited and trained over 40 graduate students, published more than 80 papers and been awarded over $5 million in funding. Reasearch on creativity shows that a vast majority of small children are actually creative geniuses. Dr. Calvin Taylor, one of the great pioneers in education for the gifted and talented, found some great surprises in his research. He gave eight tests of divergent creative thinking to 1600 children in the Headstart program. He gave the same test to these children over several years. The first test were given when the children were between three and five years of age. Ninty-eight percent of the children scored in the genius category. When these same children took identical tests five years later, only 32 percent scored that high.